Explanation: On June 30, Venus and Jupiter were close in western skies at dusk. Near the culmination of this year's gorgeous conjunction, the two bright evening planets are captured in the same telescopic field of view in this image taken after sunset from Bejing, China. As the two bright planets set together in the west, a nearly Full Moon rose above the horizon to the south and east. 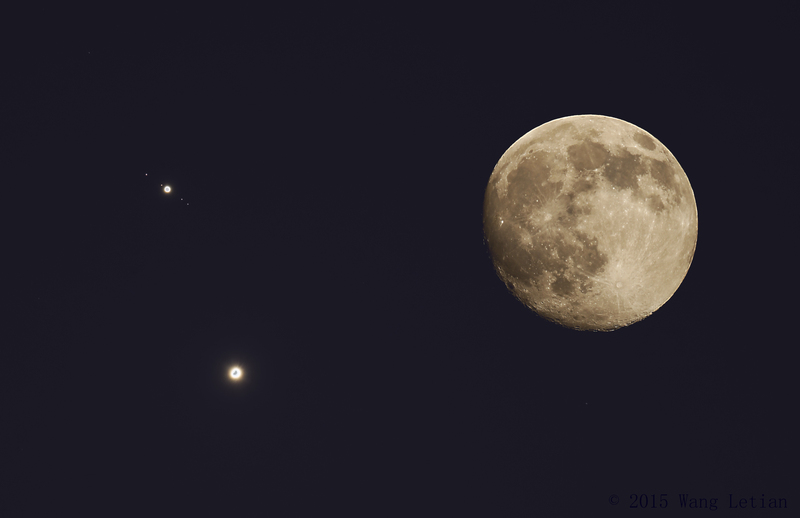 Imaged that night with the same telescope and camera, the rising Moon from the opposite part of the sky is compared with the planetary conjunction for scale in the digitally composited image. The full lunar disk covers an angle of about 1/2 degree on the sky. Visible as well in binoculars and small telescopes are Venus' crescent and Jupiter's four Galilean moons. Of course, Venus and Jupiter are still close.